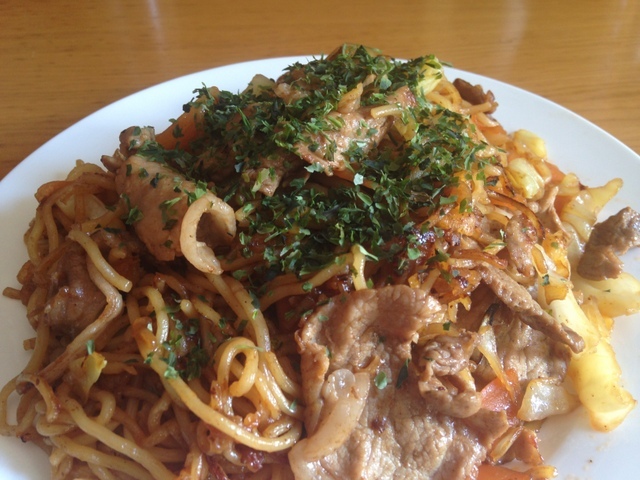 Sauce Yakisoba (Sauce Fried Noodles) is a something nostalgic food. It is called just as Yakisoba, too. If you go to Japanese festival at shrines, you will find many booth (called Yatai in Japanese) serving light meals. The booth serving Yakisoba should be at all festivals. Also you can buy it at baseball stadiums. It’s very popular and casual light meal. 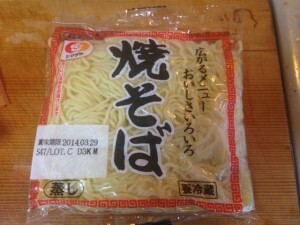 However it’s using Chinese noodles, we cannot find it at Chinese restaurants. 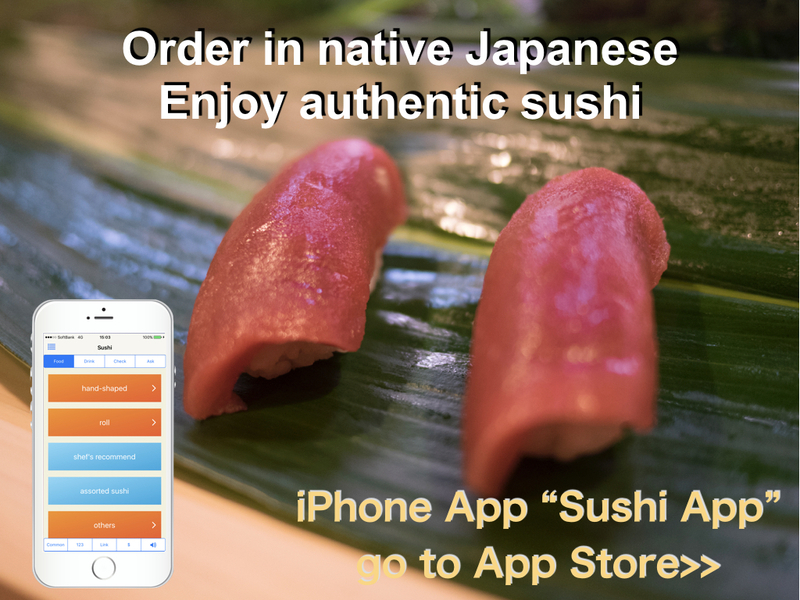 Of course, we cannot find it at traditional Japanese restaurants, too. 1 Table spoon Lard (15ml) —Cooking oil is OK instead. 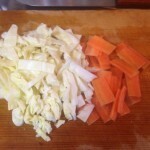 1) Cut Cabbage and Carrot about 1 to 1.5 cm width. 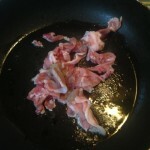 2) Cut Pork as a bite size. 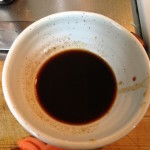 3) Mix Tonkatsu sauce and Worcestershire sauce together. 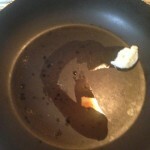 4) Heat lard in a fry pan. Add Pork, Salt and Pepper, then fry until its color changed. 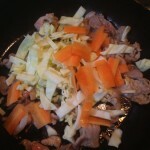 5) Add Cabbage and Carrot, then stir fry until they become a little soft. 6) Add Noodles and about 30ml water, then stir everything. 7) Add Tenkasu and pour sauce, then stir everything. Serve it in a dish and sprinkle Green Laver on top. If you have Red Pickled Giner (Benishoga), add it a little. 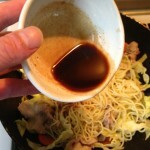 I used cabbage and carrot at this time, but I also use bean sprout (Moyashi) in addition to them. Add some soy sauce may be good. I’m not sure the package for Yakisoba (steamed Chinese noodles) are sold out of Japan. In Japan, you can buy it at any supermarkets. I used one from Shimadaya and it was 170g for one dish. 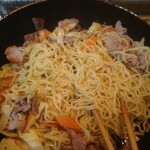 Also I used sliced pork meat because pork of beef meat are usually sold as sliced form. If you don’t have sliced one, it will be better slice it as thin as possible. 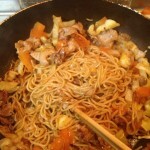 Yakisoba is typical food of B class gourmet event called “B-1 Grand Prix”. It is a popular food event for casual foods (not for cuisine class foods). This event is held once a year and many B class foods from various region are participating and competing the championship. If became the champion, it brings large economic impact to the region and food. TV programs report about the event and who (which food) win the champion. 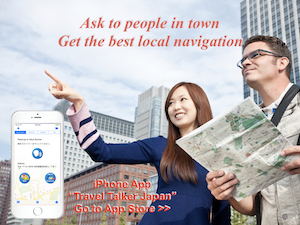 After that, many tourist visit that region to eat the food. Sometimes, large companies launch new product with people got a champion. Actually B class gourmet is a kind of local specialty, it will become a nation wide brand once it got a champion. Several different Yakisoba got the champion in the past. 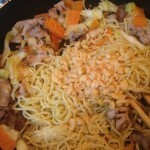 It means there are many local specialty Yakisoba in addition to Ramen. If you have a chance to come to Japan, it would be better to visit several region and try different Yakisoba and Ramen.